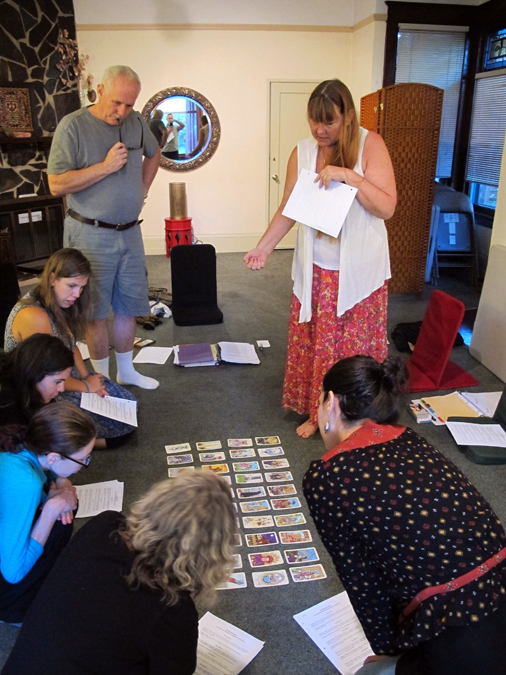 Course purpose and objectives: Learn to read the Tarot as a system rather than individual cards. The system consists of 9 Tarot Families (nine groups of cards based on numerology and founded on ancient archetypes.) 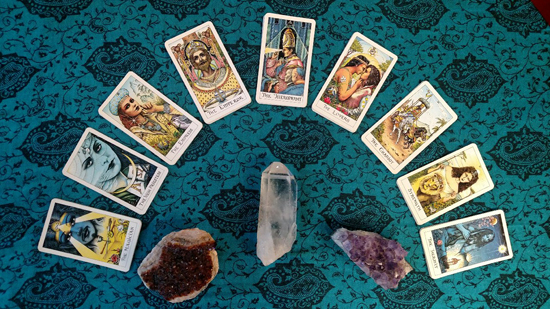 This 9-week hands-on journey will teach you to read the Tarot with absolute confidence. You will also have weekly interactive reading practice and learn to use advanced skills by the end of the course. Many, not all, are able to confidently read professionally upon completion of this course; this is especially true if you have some prior love of or history with the cards. The course is recorded, so if you must miss a class, you will receive weekly recordings and handouts, and I am available for questions. Tuition: This course is offered on a sliding scale basis with three choices for your tuition. 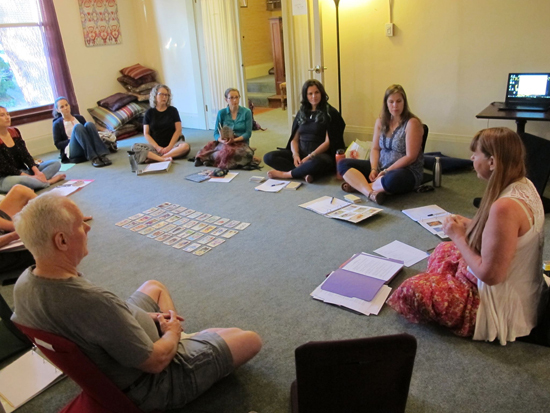 The Tarot course and materials are the same regardless of tuition. The sliding scale is offered to make it more affordable for everyone. Please support the instructor with the level in alignment with your income and personal situation. The choices are $195, $235 and $325. You will see the tuition choices when you click to register. If you require a payment plan, contact Sally at sally@sallydubats.com. You will need: A Tarot deck (classic is best), a 3-ring binder and paper. Please bring the birth dates of a few friends/family. Please contact Sally at sally@sallydubats.com if you have questions - especially regarding selecting a Tarot deck if you need assistance. Sally Dubats is a published author and has guided sacred rituals and workshops for over twenty years. She is a professional Tarot reader, founder of the Portland Tarot Guild, and a member of the American Tarot Association. She views the Tarot as a beautiful vehicle to understanding our personal archetypes, and the gateway to our Highest Selves. Sally has been teaching Tarot classes and courses for over twenty years. She is a professional Tarot reader, founder of the Portland Tarot Guild, and a member of the American Tarot Association. She views the Tarot as a beautiful vehicle to understanding our personal archetypes, and the gateway to our Highest Selves. Sally commands the room with grace and ancient wisdom. Her class is interactive, inquisitive and equally open-hearted and open-minded. She gives you practical tools that you can learn the deep information with and still reference on your journey well after the class has ended. I've actually thought about taking it again just to see what new insights might arrive! She builds a sweet little community in her classes. Her thoughtful presentation of the tarot's wisdom is impressive and fun! ~ Tracy T.
I have tried other Tarot classes and came away trying to remember cards. This class was SO different. I came away really seeing the cards and understanding them from a metaphysical standpoint - from many dimensions! If you want to learn the Tarot, take Sally's class! Tori H.
Sally is an excellent creator and facilitator of Sacred Space. Her knowledge and resources are unlimited. Sally's capability to transform a person's experience is a gift. I have had the privilege to work with her in a group atmosphere where she shares her many ways of delivering a life changing shift. She delivers with grace, sincerity, and humor. She is the most integrated being, with the biggest heart, I have had the pleasure of meeting. ~ Melissa D.
You'll definitely want to take the journey she unfolds for you! ~ J.D.